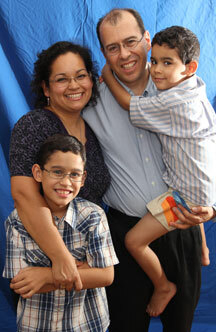 Hugo and Estrella (Star) Prieto are members of St. Ambrose Parish in Philadelphia and they have two children, Daniel and Emmanuel. They are bilingual Pre-Cana instructors for the Catholic Institute for Evangelization and Natural Family Planning instructors for the Family Life Office. We have truly been challenged as Catholics in this most recent election. Putting aside our political hats for a second (or for at least the next “400 words or less”), what it forced us to do personally is think long and hard about how we are teaching our boys to be pro-life. It goes so much deeper than the Sixth Commandment or only telling them that abortion is wrong. It means teaching them to respect life in every instance, from conception to its natural end, to treat ALL people with dignity and to treat their own selves and their own bodies as gifts from our Heavenly Father, as temples of the Holy Spirit. Wow! That’s a “ginormous” job! The only way we could do it is with God’s help. We must always fall back on Scripture, on Mass, on the Holy Eucharist, on prayer “without ceasing,” on our faith (or “phaith” if you prefer). When the boys fight, then quickly make up (which seems to be part of the ebb-and-flow of their existence), we reinforce to them how they must love their brother throughout all of it. Very recently, Emmanuel wanted to give a donation to the Salvation Army, as the man rang his little bell outside our local supermarket. I asked the gentleman to explain to my son how his dollar would help people. He did so, and Emmanuel’s innocent eyes nodded in understanding. We took our boys with us to the American Red Cross the week after Hurricane Sandy to witness the process of blood donation, and we explained how we could help make someone well or even save a life. They seemed somewhat disinterested, especially Daniel, until they were allowed free reign in the “cantina” to eat cookies, pretzels and juice. Oh, well! These are just a few examples of how we take daily activities or occasional events and attempt to make them opportunities for spiritual formation. Our God also instructs us daily as parents by putting certain people in our path. At times they are individuals who completely irritate us. Do we treat them with dignity anyway? At times our paths cross with individuals who are helpless, and we are called to help. Do we help them? Other times, and most often, our faith is challenged or even ridiculed. Do we stand up for our beliefs with conviction, especially when it involves the sanctity of human life? Our children are always watching us. Are we providing the right examples? Are we “saying the right things”? Are we reading the right materials and watching the right TV programs? Our children are watching us. Are we fulfilling what our Lord asks of us? And finally, are we demonstrating respect for ourselves, for our own physical, emotional and spiritual selves and that of our spouses, through the sacrificial love of marriage? That is the best example we can give our children. PREVIOUS: Holiday dilemma: Feast with the in-laws or your own family?